Please join us for the second North Woodvale Primary School Colour Run!! This year will be even better, with more people, more colour, more after fun run activities and WATER!!! The Colour Run is an un-timed fun run with a difference. You can run, walk or crawl the course as many times as you like. 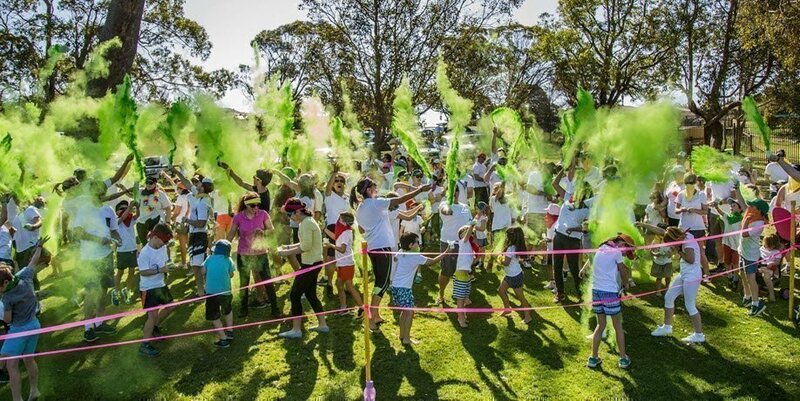 Situated along the course are colour stations and water stations where you will be doused with colour powder from head to toe and soaked with water from water guns (if you wish). The aim: To start off wearing white and finish covered in colour!! The Colour Run is open to all family and friends of NWPS students. Get involved in a great community event and encourage others to join in the crazy fun also. Parents, grandparents, cousins and friends are all welcome. At the completion of the race, participants are encouraged to stay for a picnic, music and use of inflatables. What to wear: Please wear clothes which you don’t mind getting covered in colour. A white shirt will work best for showing up the different colours. - A towel will be handy for dusting off and keeping the car clean on the way home. What is included in my registration? For the $16 entrance fee you will be given access to the colour course, inflatables and race pack. Participants will be given a choice of bandana, sunglasses, or headband (Choice only will be given whilst stocks last). Children under 3 are free however they will not receive a pack. The Course – You are welcome to run with a jogging pram and kids. Parts of the course are wheelchair friendly so don’t let anything deter you! Unfortunately due to safety reasons scooters and bikes are NOT allowed. No animals of any kind are permitted at the event. Can I drop my kids off and collect them at the end of the event? No. Whilst adults are not required to participate in the colour run, it is expected that all children who are running will be supervised by an adult. Will the colour ruin clothes or shoes? As with anything dirty, the sooner you wash it the better. We suggest wearing items that you don’t mind getting colourful, so leave your designer gear at home! Will First Aid be available? A number of nurses will be stationed around the course to administer First Aid should the need arise. What happens if it is raining on the day? The colour run will be a rain or shine event. We will consider postponing if the weather is particularly bad. Event Notes:Please arrive half an hour before the scheduled race start time to finalise registration and be allocated a starting position.